LEADLESS: The next generation pacemakers?? On 8th October 1958, the first definitive electronic pacemaker was implanted by two surgeons in Sweden with procedure of opening the chests and suturing two electrodes on the surface of the heart and further placing a machine on the abdominal wall of the patient. More than 5 decades later, all device implantation has been taken away from surgeons and has been taken over cardiologists, especially Electrophysiologists , who are putting a small device in the chest and connecting it with the leads passed through the venus system percutaneously to the heart. Between 3 and 12 months of follow-up, there were no pacemaker-related adverse events reported. There were no device embolizations, late perforations, or patients with a device-related infection or infection of unknown origin. 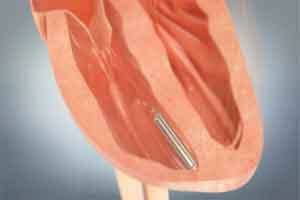 The investigators concluded that the LCP showed “very stable performance and reassuring safety results during intermediate-term follow-up” supporting the promise of this device as an alternative to conventional pacemaker systems. Comparative trials with longer follow-up are needed to further assess the performance of the LCP compared to lead-based pacemakers and to inform optimal case selection for each type of system. Other Critics noted that the 1-year findings reported by the investigators shows “remarkably stable pacing parameters…” indicating a projected longevity of about 10 years, “even with 100% pacing.” The safety measures were also promising. However, they noted that the sample in this study was small, the implantations were performed at a limited number of very experienced centers, and there were a few serious complications. Hence, Further study is needed. With this trial, there is a growing excitement among the cardiologists for the leadless pacemakers, for the selected indications. 0 comment(s) on LEADLESS: The next generation pacemakers? ?